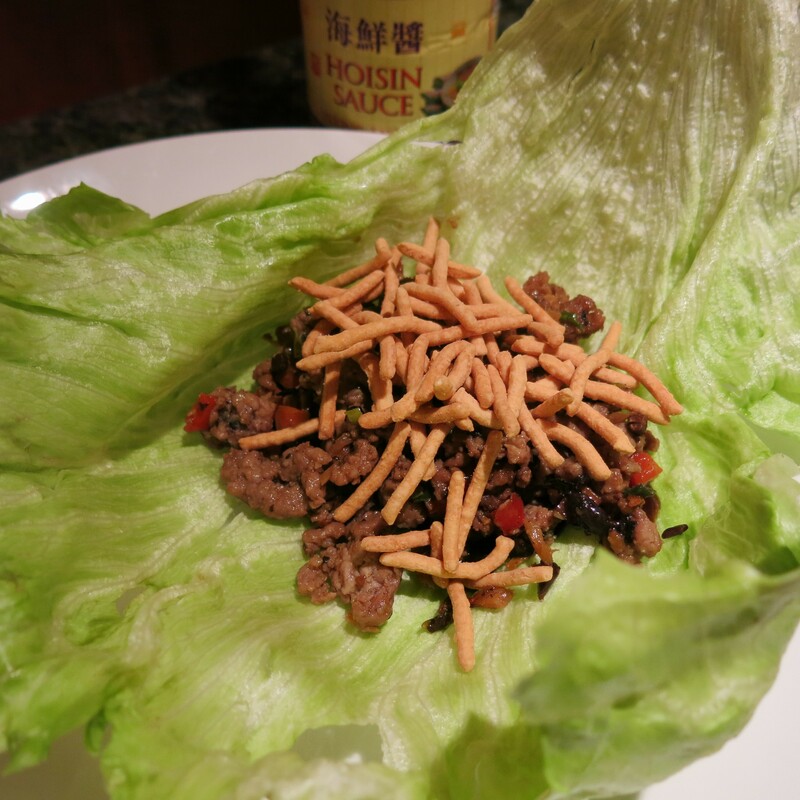 San Choy Bow is what we’re really talking about here…Lettuce Wraps with Asian Flavors or the simpler and more to the point, Chinese “Tacos”. 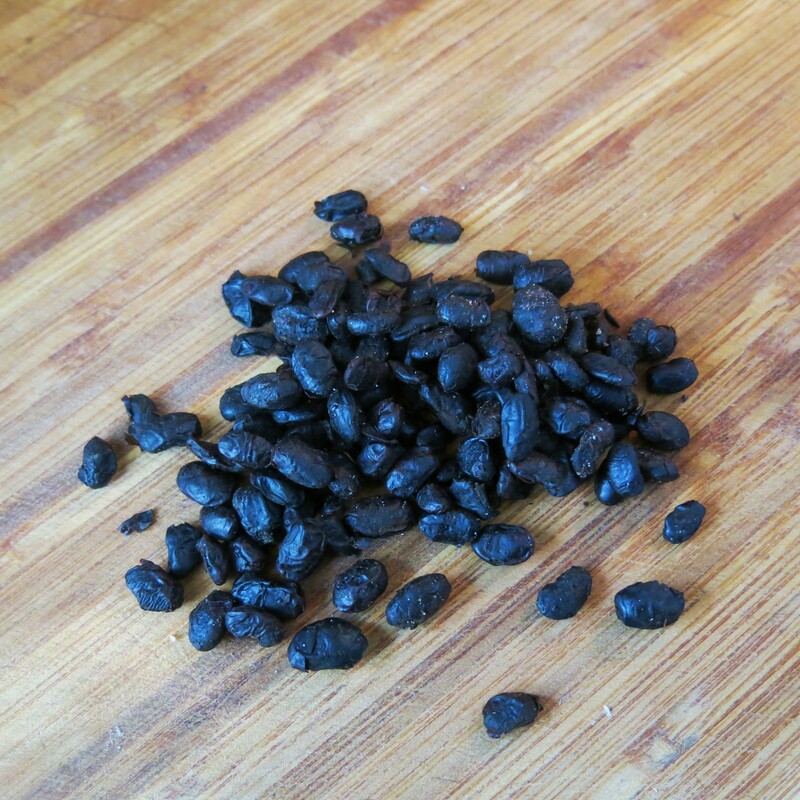 These can be prepared quickly, are incredibly delicious with a mix of salty-sweet flavors (they have hoisin sauce in them) and kids love them…at least ours did and do. This is fun food, with the benefit of being delicious. Iceberg lettuce works best with these. I’ve tried both Boston and Red Leaf Lettuce, but Iceberg holds up the best and it has the bonus of the “crunch factor”. Crunch is very important, particularly to children. Texture is a good thing and most of us prefer texture in our food. These offer complex flavors with the simplicity of preparation and The Goddess thrives on that complex-simple relationship in her life. Those flavors keep things interesting and keep us coming back for more. In a bowl, combine the first 12 ingredients very well. I use my hands for this. Set aside for at least 30 minutes or cover and refrigerate overnight. Heat a skillet over medium heat. When hot add the oil, the carrot and stir around for a minute. Add the ginger, water chestnuts, bell pepper, then the marinated meat mixture. Stir-fry until the meat is cooked through and the mixture thickens. You may need to add water, 1 or 2 teaspoons at a time. Remove from the heat; stir in the peas. Let stand for 5 minutes; stir again. 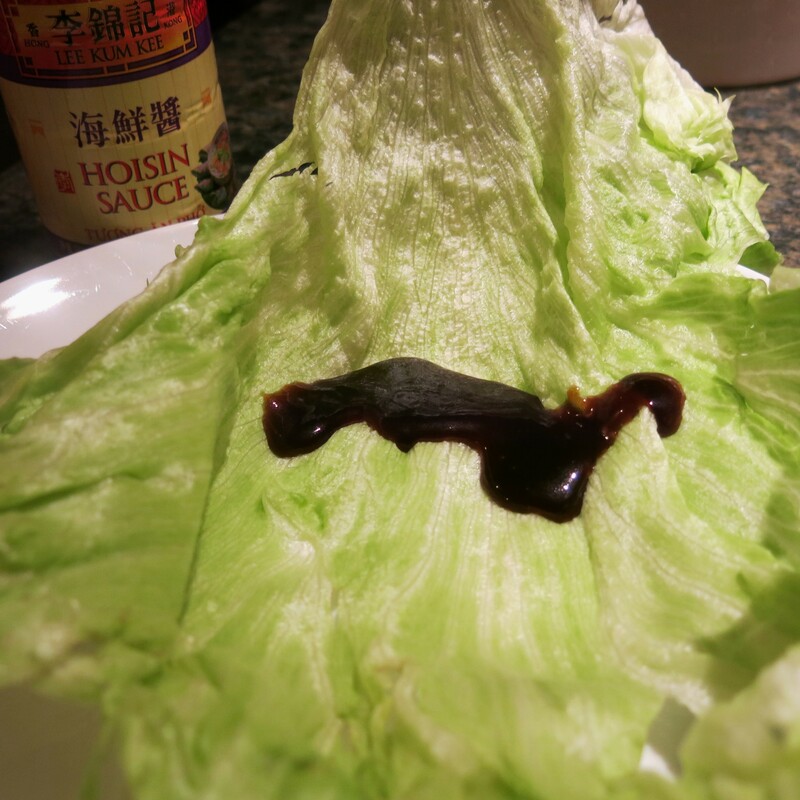 To serve, spread a thick smear, about 1-2 teaspoons of hoisin sauce in the “bowl” of the lettuce leaf. 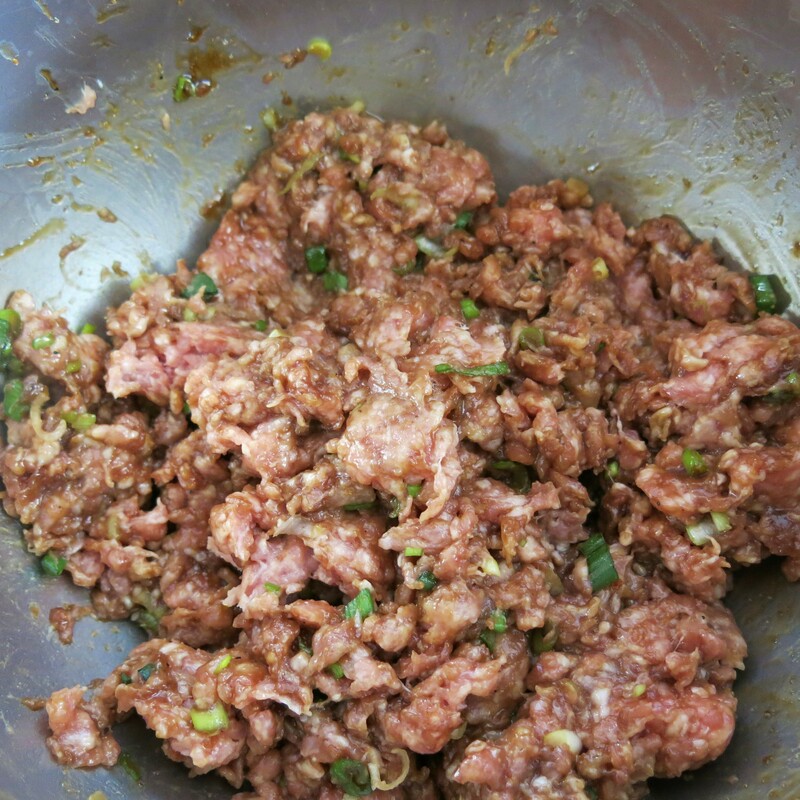 Place 2-3 tablespoons of the meat mixture on top of the hoisin, sprinkle with some chow mein noodles and cilantro, if using, roll up and eat immediately. Iceberg lettuce holds up and has more crunch, but Boston lettuce has a softer, more buttery taste. Kids of all ages, love these. Chinese “Tacos” Recipe©Marcia Lahens 2015. All rights reserved. I swear to you the most difficult part of making these is separating the lettuce leaves. That’s why sometimes I opt for Boston lettuce, but that crunch is missing and that’s so much a part of these. I roll these smaller, using the inner leaves or doing some serious trimming, when I serve these as a first course. For a main course, we prefer the larger, outer leaves. I used ground pork for these…I guess I usually do, but very finely diced chicken is more the norm. When I have the time, I prefer to combine the first group of ingredients, let the mixture stand for at least an hour (in the fridge, please…you want that pork cold when it hits the skillet), then frying it all up. Frying the carrots and ginger together first helps caramelize the sugars, adding to the overall flavor. Then toss in the meat and cook just until done. Don’t overcook the meat. It probably won’t brown, but that’s okay. Feel free to embellish here; add some diced water chestnuts (I usually do, but there wasn’t a can in the pantry! ), diced bamboo shoots are nice, as are fresh, fresh, fresh bean sprouts. If you were thinking that canned might work, DON’T! They’re just rather nasty. After you’ve tasted really fresh bean sprouts, there’s no going back and fresh are readily available in stores now. I added fermented black beans. We like the flavor, the saltiness and the texture. I didn’t even bother to rinse them, as I wanted the salty goodness to remain intact. As I mentioned, removing the leaves from the head of lettuce is probably the worst part. They want to tear and cling to each other…very needy, they are. So do the best you can. I put a good smear of hoisin in the “bowl” of the leaf. This is a pretty big leaf, but you can tear off the part closest to the core, as it is thicker and more difficult to roll. Add about 1/3 cup of the hot, sautéed mixture, noodles and roll. Serve immediately. For a larger group, I let everyone do this themselves and that’s part of the fun. Now you can fry some rice noodles in very hot, clean oil, but I cheat! That’s right, The Goddess is a cheater…but an honest one, because she’s telling you that right up front. I use regular chow mein noodles, because I have those around to toss on leafy salads, into slaws and on stir-fry veggies, at the very last moment, of course. Our first-born, The Scientist, is the one who started me on chow mein noodles and salads. It’s a good combo, try it. Since I can’t get enough cilantro, I add some fresh cilantro to mine, but this one is for The Latin Lover, who is less fond of it. 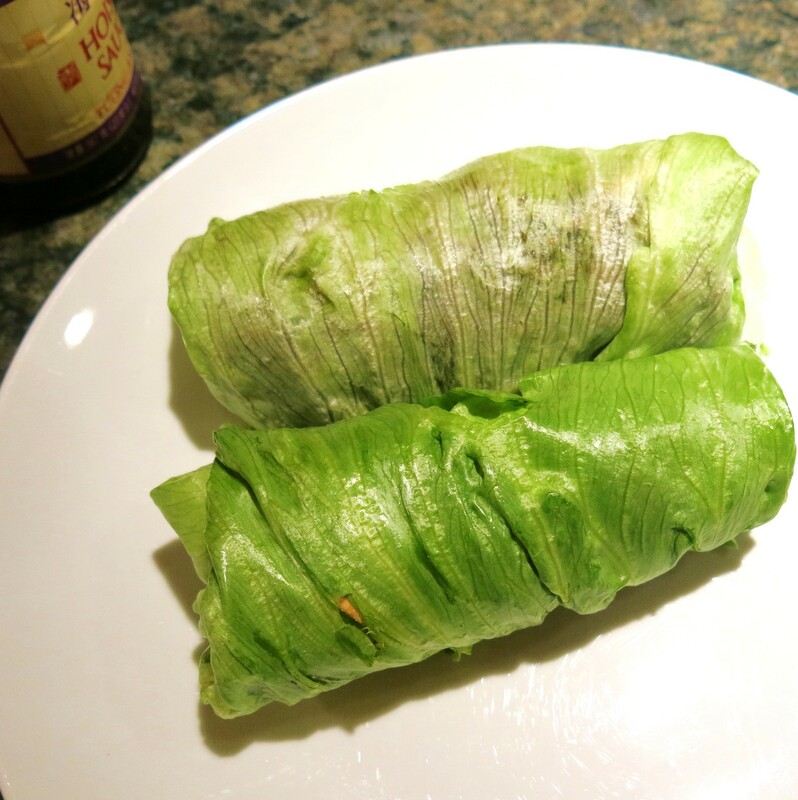 Then you just roll them up like you would an egg roll or a cabbage roll, bringing the top down, tucking it under the meat, folding in the sides and rolling it up. I left these completely unimbellished, so you could really see what they look like. I prefer not to cut these at an angle, which would make presentation much better and more interesting, but they are quite frankly, a pain to eat when cut. Serve some extra hoisin on the side, if you wish. And that’s all she wrote….